Ritual of the Bacabs is the name given to a manuscript from the Yucatec Maya containing shamanistic incantations written in the Yucatec Maya language. The manuscript has been dated at the end of the 18th Century, though this is not certain. The style of writing in the manuscript suggests that much of the information included was copied from older works. The work references many figures in Maya mythology who are for the most part unknown from other works. 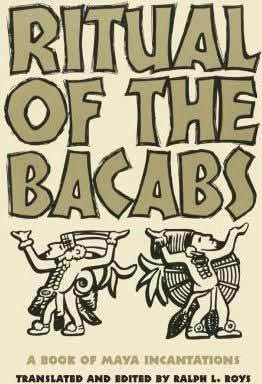 Ritual of the Bacabs includes some forty-two main incantations, with fragmentary supplements throughout. Most of the manuscript is written in the same hand. In his translation, Roys referred to this main writer as the "Bacabs hand." There are intrusive passages written in a different hand on pages 20, 21, 62, and 63. Page 70 includes a medical prescription in a different hand. Of the last twenty-four pages, eighteen discuss medicine and plant lore (pp. 215–227, 229–230, and 236–237), three include fragmentary incantation (pp. 231, 233, and 235), and three are blank (pp. 228, 232, and 234). These final parts of the text and the first three pages have never been translated. It is unknown if these last twenty-four pages are written in the same hand as the bulk of the manuscript or in another. In translating the work, Roys wrote "I do not feel competent to comment on the handwriting." The incantations make several references to Can Ahau, which is either the day 4 Ahau or an alternate spelling of Caan Ahau ("Sky Lord"). Other "proper names" may really be titles. The name Hun-pic-ti-ku ("Eight-Thousand Gods"), which appears in the eighth incantation, may be derived from the Tahdziu deity Hunpic Dziu ("Eight Thousand Cowbirds") or the Izamal deity Hunpic Tok ("Eight Thousand Flints"), or it may be a collective term for all Maya gods. Diseases and the diseased are also personified in the incantations. In the seventeenth incantation, dealing with the "snake-pulsation-of-the abodomen," the affliction is described as the son of Ix Hun Tipplah Can ("Lady Unique Pulsating Sky"). There are a few references to Christianity in the text. Almost every incantation ends with "Amen," and the thirty-ninth uses "Jesus Mary" (Jesuz Maria) as an exclamation. Ritual of the Bacabs is filled with symbolism that has long since lost its significance and meaning. In his Maya History and Religion, J. Eric S. Thompson wrote: "The only parallel which comes to mind of the Book of Revelation. Many plants, birds, and insects, all clothed in symbolism and allusions to lost mythology, are important features...even in translation the incantations are very hard to comprehend."